I know some of you remember this guy from a few months ago. He's part of a handful of banners I'm doing as a commission for a friend of mine. This guy has been sitting on my desk for a couple weeks now while I finished the one Attack bike I started. Unfortunately, there were some problems with him. When I went to prime him with Gesso (after making sure to clean him real well) the Gesso obscured more detail than I was comfortable with. So... I decided to use Dawn Power Dissolver to strip off what I had so I could start over with all the detail still there. This guy is my next big project so keep an eye out for more painting updates. I'm really going to see what I can do with my painting skills. I am a big fan of priming with Gesso, but given that FW recommends priming resin with automobile paint, I wouldn't use Gesso on it. Knowing your skill, it will end having a truly awesome paint job, i'm quite sure. Hopefully he will be fine. I'm really going to try and paint him up as best I can. Peter: I still have the greenstuff banner tutorial. I need to put it back together and repost it. I'm putting the finishing touches on the "Painting Black Armour" tutorial. Peter: I've still got to clean it up some but I'll have it posted early next week. I've been working with a black gesso and Future floor polish mixup for my priming. Its roughly 60/40% mix and I havent had problems with details being obscured. This model is a simply amazing sculpt. Can't wait to see your paint job Ron. Evernevermore: After cleaning it off with Dawn Power Dissolver, regular paint sticks without any problems on the resin. Now I'm priming it with some slightly thinned black paint to make sure I keep all the details. 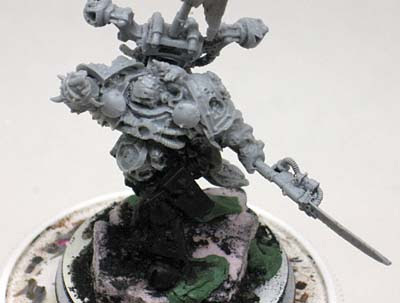 zealot: I printed out some pics from Forgeworld to see how they painted it up to give me some ideas. Rick (the guy commissioning the piece) wants me to follow his color scheme so the model fits in with the rest of his army. Just a quick one, on the topic of Dawn Power Dissolver, I've only been able to find it in 'spray' form. Do you empty this bottle to use it or do you buy it in bottles elsewhere? Peter: I've only found it in the spray form as well. The first time I used it, I poured it all out into a small container. The second time, I just sprayed it onto the model itself. I think the second time worked better because I didn't waste any of it. The stuff is so thick, it just clings to the model. Gunze Sangyo Mr. Resin primer is the best for this, with Tamiya plastic primer coming in a close second. Jason: Interesting, thanks for the tip!